The luxury Brittany Traditional Roll Top Cast Iron Bateau Bath, the perfect centrepiece for any bathroom. This stunning French styled double ended period bath tub has been manufactured using traditional casting methods in a foundry, it is then fused using the latest glazing techniques. 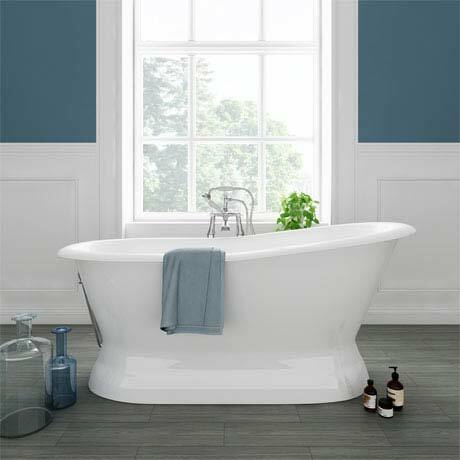 This process means the bath's interior is highly scratch and stain resistant. The exterior of the bath has been smoothed and is primed ready for painting. Bath tub has no tap holes, we recommend traditional wall mounted or free-standing bath taps with a polished chrome waste and overflow to complete the look (sold separately).